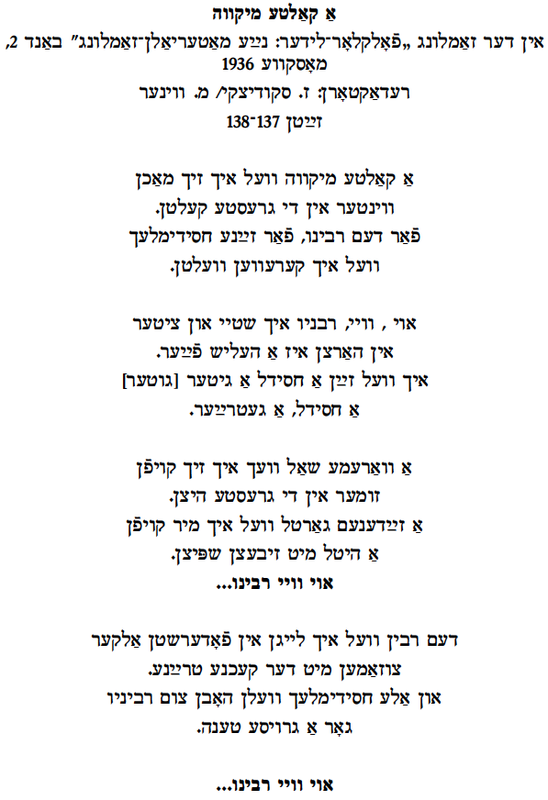 I was asked to post the song “Reb Tsudek” as sung by the Yiddish poet Martin Birnbaum. He sang it to Michael Alpert and me in 1984-85 in NYC. But, alas, I cannot find the original recording so I have recorded it myself. Birnbaum was born in 1905 in Horodenke when it was Galicia in the Austro-Hungarian empire. Now it is in the Ukraine – Horodenka. According to a NY Times obituary he came to the US in 1923 and died in 1986. 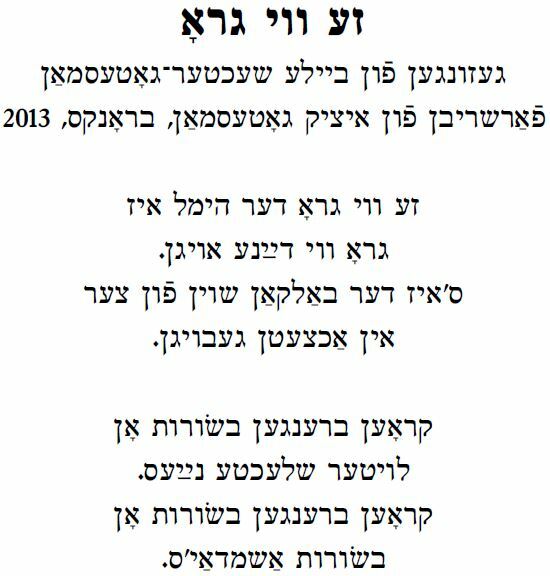 In the YIVO Institute’s Ruth Rubin Legacy Archive, Birnbaum sings four songs but not this one. Those recordings were done in 1964. I believe there is more Yiddish folklore to be discovered about this shlimazel (bad luck) character Reb Tsudek. When I asked the Yiddish poet Yermye Hescheles about him he affirmed that there was such a comic figure in Galicia, where both he and Birnbaum were from. 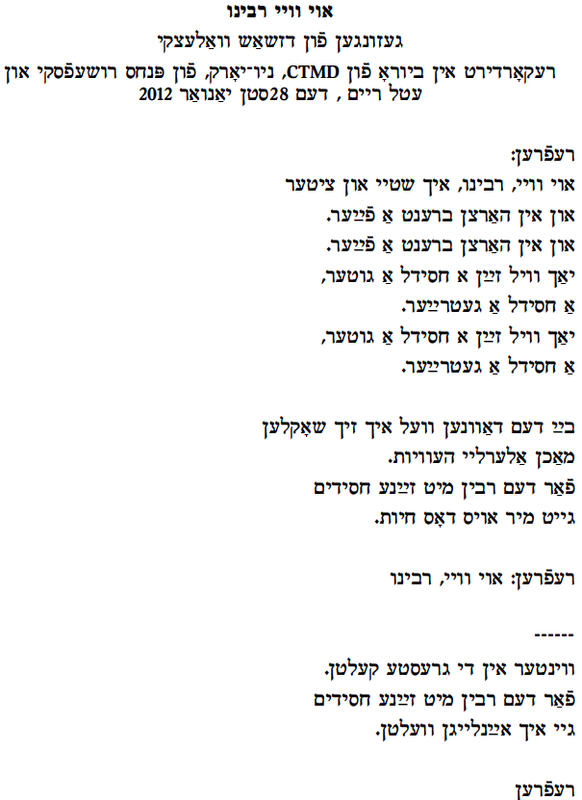 The song mocks the Hasidic lifestyle – absurd devotion to the rebbe, irresponsibility, staying poor. The word “hiltay” – defined by the dictionaries as “libertine” “skirt-chaser” “scoundrel” – is really a cue that this is a 19th century maskilic, anti-Hasidic, song. The word is often used in such songs. The humor also hinges on the double meaning of tsimbl both as a musical instrument (a hammered dulcimer) and as a verb – “to thrash or scold someone”. A tsimblist, about to be thrashed by his wife. In the song two towns are mentioned: Nay Zavalek remains a mystery but Grudek, west of Lviv, is Grodek in Polish and Horodok in Ukrainian. Fort a yid tsu zayn rebn – Reb Tsudek. Tsudek iz a yid, a lamden. hot gehat a gutn shabes. fun Zavalek bizn in Grudek. and has a belly that weighs ten tons. with both paws [large, rough hands]. a tsimbl with no strings. Before we enter the new year, let us do our part to remember that 2014 marked 100 years since World War One and post a song about that time. 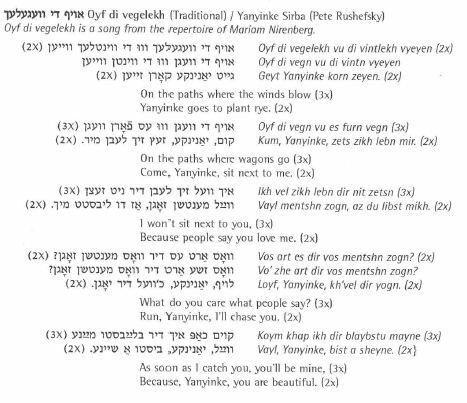 In memory of her first yortsayt (memorial anniversary), the 2nd day of Khanike, I am posting the last song that I recorded from my mother, Beyle Schaechter-Gottesman, a few months before she died. At 93 years of age she could still sing well. Vienna 1948-49. 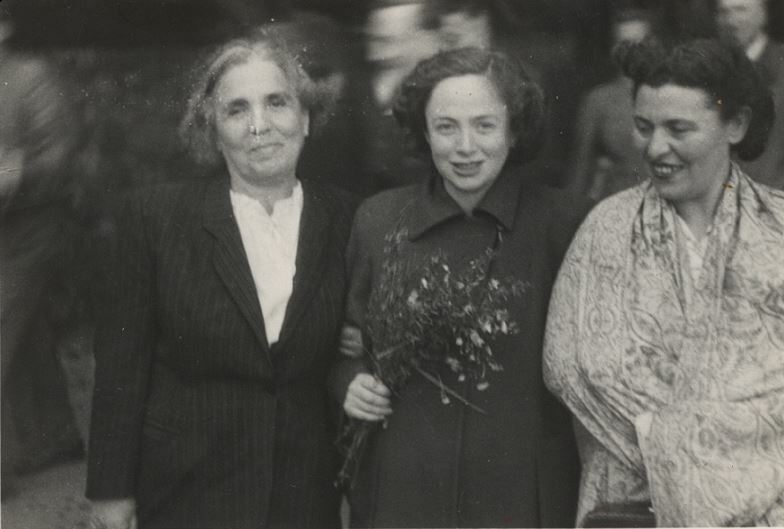 From left: Lifshe Schaechter-Widman, Beyle Schaechter-Gottesman, Mitsi Weininger. I cannot find the full text for the song, but my mother knows it from Chernovitz, which was Romania when she grew up. We both agreed that it was about WWI but have no other information on the song. Could “in akhtsetn geboygn” refer to something else other than 1918? The rhyme “nayes” (news) and “Ashmoday’es” (Asmodeus’s) is wonderfully original. As usual, any help finding more lyrics to this unusual song would be appreciated. Ze vi gru der himl iz.